Elephant Tooth Ivory Animal , Snake Skin Reptile , Reptile Skin , Resin Plant , Grass Fibre Plant , Animal Hide Skin? Side-blown trumpet carved from a single piece of cream-coloured ivory (Pantone 7401C), hollowed out and then polished over the exterior surface to remove most of the tool marks. The interior walls are a darker reddish brown colour and may have been shaped using pyro techniques. The trumpet has a narrow proximal end with flattened lip and markedly oval section; an opening has been cut through this to create an oval finger-hole to vary the note. The embouchure has been cut from the concave side of the tusk into the body of the trumpet, and has an oval upper part that gradually becomes more circular as it tapers to its base; there may be some use-wear around the lip. This area has been embellished with a mouthpiece surround, carved to stand proud of the body surface. The front of this mouthpiece consists of an angular lozenge-shaped piece with its tips extending as narrow spurs that have been carved in the round. These have flat cut ends, and a flat upper surface. A shallow decorative groove has been carved partially around the upper surface near the end of one of these. The back of the mouthpiece has been shaped into 2 rounded raised collars with a deep groove between. While this may be a decorative feature, there is some reddish surface discolouration inside the groove that suggests it may have originally been used to seat a length of fibre binding, which is now tied just below the mouthpiece area, near the proximal end. This binding has been made from pale brown grass fibres, dyed a reddish brown colour (Pantone 4635C). It is mostly made of fibre bundles gathered together, with at least 2 knots visible, but two ends have been more carefully plaited from 2 groups of strands. This binding may have originally been used to attach a carrying or suspension loop; there is some resinous material covering a small area of this that may have been used to fix one end in place. Below the mouthpiece, the body follows the natural curvature of the parent tusk, gradually expanding towards the bell mouth, which is thin walled with a slightly rounded lip and is markedly oval in section. This area has been covered with a rectangular piece of dark brown reptile skin (Pantone Black 4C), stitched together along its joining edges to form a seam running up the side. This stitching may have been done with a thin piece of hide cord. The piece is also perforated along its lower edge. At the top, there are traces of a transparent resinous material around the bell mouth, overlaid in part with a narrow strip of yellow to bluish gray snake skin (Pantone 5435C). A separate piece of this is also stuck to the interior of the bell mouth, partly over a triangular area where a piece of the ivory body has been broken and lost. It has a weight of 326 grams, and is 386 mm long. The proximal end measures 16.7 by 12 mm across, and has a finger-hole diameter of 9 by 7 mm; the mouthpiece is 107.5 mm long and 36 mm wide in the section surrounding the embouchure, and has a thickness of 55 mm from front to back. The embouchure has a diameter of 35 by 25 mm at its top edge, and 13 mm at its base. The length from finger-hole to the edge of the embouchure is 92 mm, and the bell mouth measures 67.5 by 57 mm across its outside edge, and 50 mm across the internal opening. The plaited section of grass fibre cord is 2 mm wide, and the reptile skin covering extends from the bell mouth to 127 mm down the length of the body. Purchased by Henry Balfour at the Stevens Auction Rooms in 1909, it is said to come from the Uele District, and could be either Zande or Mangbetu in origin. 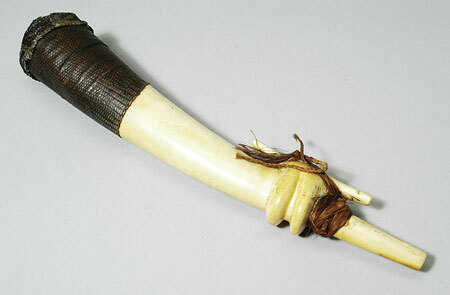 An early description of the Zande mentions their use of ivory trumpets: "some of the officers, or leaders, have large war trumpets made of elephant's tusks... they are sounded from the side, like a flute", illustrating examples made in a single piece, or of wood and ivory bound together (J.G. Wood, 1868, The Natural History of Man Vol. I, p. 493). Larken also discusses this type of object: 'The powerful Vungara Chief Ndoromo, grandfather of Zungumbia of the Tambura District, had a magnificent trumpet made out of an elephant tusk, carved and lapped in skin... No doubt these trumpets were used in Court ceremonial, for they seem only to have been in the possession of the paramount Chiefs" (P.M. Larken, 1927, "Impressions of the Azande", Sudan Notes and Records X , p. 105). This object is currently on display in Case 81A. Accession book entry [Balfour 4, p. 10] - No. 87 Side-blast ivory trumpet, 15 inches long, with elaborately carved mouthpiece, the wider part covered with snake-skin. WELLE (UELLE) district, CENTRAL AFRICA (N.E. BELGIAN CONGO, ?AZANDE or MANGBETU). Purch[ased]. 1909 (Stevens). Card Catalogue Entry - There is no further information on the tribes catalogue card [RTS 6/2/2004]. Sparks, Rachael. "Trumpet, Zande or Mangbetu" Southern Sudan Project (in development). 03 Jan. 2006. Pitt Rivers Museum. <http://southernsudan.prm.ox.ac.uk/details/1938.34.87/>.